Prismatic Compass and Surveyor Compass: Its Types, Uses. Do you want to know more about the prismatic compass and surveyor compass? If your answer is yes, then you are at right place. Here in this article, you will learn everything. Compass is an instrument designed for the measurement of direction with the reference to the magnetic meridian. The essential parts of a compass are a magnetic needle, a graduated circle and a line of sight. Following are the two main types of a compass. SO, let’s start with the prismatic compass. 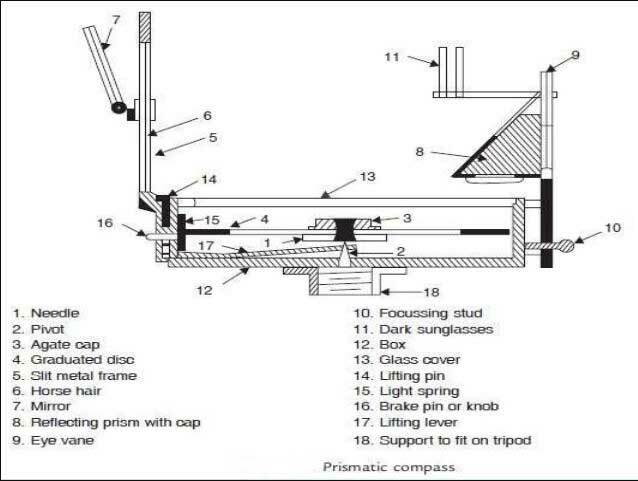 Components and Adjustment of Prismatic Compass. 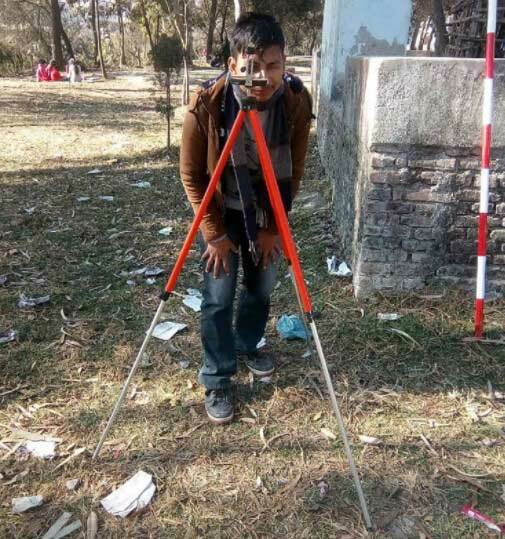 Procedure of Survey on Prismatic Compass. This type of compass is a light and simple instrument and is used for rough surveys where too much accuracy is not necessary. This compass is made into a box which is circular and 85 to 110 mm in diameter. In the center of the compass box, is a pointed steel pivot is used. A magnetic needle of broad form is balanced over the pivot, and to this is fixed a light aluminum ring. The aluminum ring is graduated in degrees and half degrees. The graduations are marked such that the zero is at the south, 90 degrees at the west, 180 degrees at the north and 270 degrees at the east, i.e., the aluminum ring is graduated in a clockwise direction with the zero at the south. The figures showing the readings on the aluminum ring are written inverted, and a glass lid covers the top of the compass box. Dramatically, opposite the compass box are fixed the object or sight vane and the eye vane. The latter carries a reflecting prism. The eye vane is fixed at the top of the prism. The reflecting prism can be raised or lowered to suit the eyesight of the observer by means of the focusing stud. A hinge is provided so that the prism may be folded over the edge of the box when it is not in use. When the eye is brought near the eye vane, the graduations on the ring are reflected to the eye and the same can be read. The horizontal and vertical sides of the prism are made convex so that the readings on the ring are magnified. The object vane consists of a metal frame hinged to the box. In the center of this metal frame is fixed a vertical horse hair or a tine wire or silk thread. When the prismatic compass is not in use the object vane may be folded over the glass lid, covering the top of the box. When the object vane is folded over the glass lid, it presses a lifting pin which lifts the magnetic needle above the pivot and keeps it against the glass lid. Thus the wear and tear of the pivot are reduced by keeping the magnetic needle away from the same when the instrument is not in use. A spring brake is provided inside the box to damp the oscillations of the magnetic needle, i.e., to bring the magnetic needle to rest quickly before taking a reading. By pressing the brake pin inward, the Spring may be made to come in contact with the magnetic needle thereby arresting the oscillations. The object vane may be provided with a hinged mirror which may be slid to any position on the object vane, and the mirror can be made to incline on any angle. This enables the surveyor to take the readings to objects which are too high or too low. Sun glasses are provided to sight luminous objects. They are simply interposed in the line of sight and reduce the strain on the eyes of the observer. A metal lid covers the glass lid and the sighting vane when not in use. In the prismatic compass, the magnetic needle and the graduated rings are attached together and, therefore, they remain always along the north-south line when the box is rotated. Read Also: Types of Levelling Instruments used in Surveying. The reflecting prism and the sight vane are placed exactly, opposite to each other. When the magnetic needle points north direction, the reading under the prism should be zero. As the zero graduation is at the south end of the needle, and the sight and eye vanes are exactly opposite, when the north end is at the sight vane, the south end will be at the eye vane, i.e., under the prism and, therefore, zero reading is obtained. Thus the bearings of lines are obtained in a clockwise direction from the north. Read Also: Surveying Tapes: Types of Measuring Tape Used in Survey. This type of compass, being a very light and simple instrument, is extensively used for preliminary surveys of roads, rough traverses, etc., where time and accuracy is not the deciding factor. 1. For taking readings with a prismatic compass, the same may be held in hand and turned till the ranging rod on the next station is bisected by the cross hair when seen through the eye-vane. 2. The instrument should be held as nearly level as can be judged. If the needle does not oscillate, it means that it is touching the glass lid and is not being held vertical. 3. It should be held properly, and the brake knob pressed lightly. Then the reading is taken. This gives the bearing of the line joining the point vertically below the compass and the point on which the Levelling Staff is held. Even though the prismatic is designed as a hand instrument, better results are obtained by fixing the instrument on a light tripod. The tripod carries a ball-and-socket device to which the compass is fixed. With the aid of a ball-and-socket device, the compass can be turned in a horizontal plane and clamped in any position. It can also be leveled very quickly. 4. For taking a reading, the compass is fixed on the tripod and centered over the station (i.e., keeping the tripod such that a small stone dropped from the bottom of the tripod exactly falls over the peg marking the station). The compass is leveled. 5. To take the bearing of the line “AB,” the compass is centered on station “A” and leveled. The object vane and the prism are raised. 6. The compass box is turned so that the ranging rod at station “B” is bisected by the cross hair when looked through the eye vane. 7. When the needle comes to rest, the reading at which the hair line produced appears to cut the image of the graduated ring is noted. Readings may be accurately taken up to 30 minutes and estimated up to the nearest 15 minutes. Note: Least count of Prismatic Compass is 30′ minute. Watch the Video Below to Understand the Difference Between Prismatic Compass and Surveyor Compass. The surveyor’s compass is mainly used in Mine Surveying. For other types of the survey, it is not usually used. The important parts and the construction of surveyor compass are similar to that of a prismatic compass except for the following points. (1) Whereas the prismatic compass consists of a reflecting prism along with the eye vane, the surveyor’s compass consists of only a narrow vertical slit instead of a prism. (2) The magnetic needle is of broad form in a prismatic compass whereas it is of an edge-bar type in a surveyor compass. …whereas in the surveyor compass the graduated circle is fixed to the box and moves with the box while the magnetic needle remains stationary along the north-south line. …whereas in a surveyor compass the object should be sighted first and then the surveyor should go round the instrument to read the graduation on the graduated ring corresponding to the north end of the needle. The readings are taken with the naked eye. (5) The graduations in a prismatic compass are started with a zero at the south end in a clockwise direction as shown in Figure. 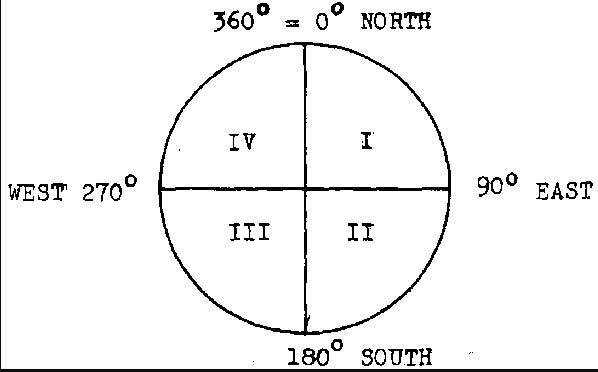 In a Surveyor Compass, the ring is divided into four quadrants and graduations are made from 0 to 90 degrees in each quadrant. 0 degrees is marked at the North and South points, and 90 degrees is marked at the east and west points. The letter E and W are interchanged from their true position so that the bearing of a line may be read in the correct quadrant. 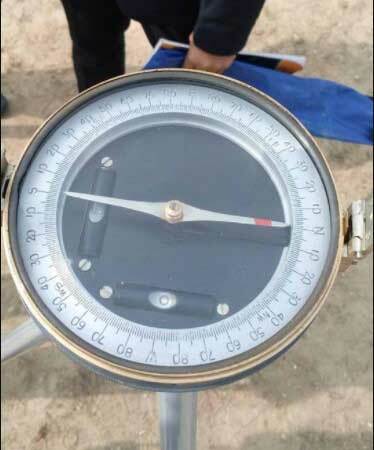 In certain Surveyor Compass, the graduation may be made from 0 to 360 degrees in anti-clock-wise direction with the zero at N.
The figures are written ordinarily unlike prismatic in which the figures are written inverted. (6) Whereas the prismatic compass may be held in hand for taking the reading, the surveyor’s compass should be supported on a tripod. Note: Least count of Surveyor Compass is 15′ minute. Thanks for Reading this Article! Please, Don’t Forget to Share it. Chain Surveying: Its Procedure, Instruments, and Principles.